Paul Hellyer, who has long insisted that aliens have visited Earth for many years, says that when aliens saw the atomic bomb they decided that we were a great threat to the cosmos. I don’t want to disturb what you’re doing right now, but apparently four different species of aliens have been visiting Earth for thousands of years. 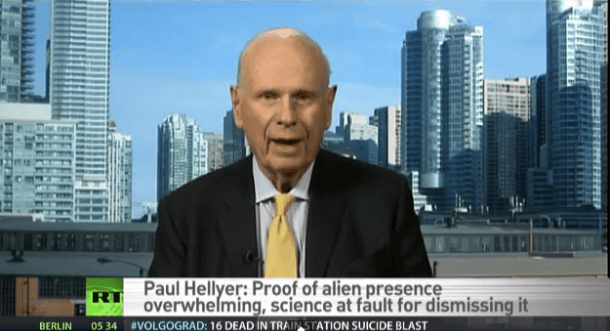 I don’t quite have the evidence at hand, but Paul Hellyer, who used to be Canada’s defense minister, claims he has. The reason for this, he said, was that man was stupid enough to invent the atomic bomb. Aliens are frightened that we’re going to use it again (and again) and that this will affect the whole balance of the cosmos. Hellyer suggested that there are Edward Snowden-style whistleblowers who have already revealed government knowledge of alien visits. “It doesn’t take long to get your hands on it,” he said. Ah, that’s why it’s called the Samsung Galaxy. Microchips and Kevlar vests are two of the other creations that, according to the serious Hellyer, came from outer spatial sources. It’s easy to dismiss Hellyer as being, well, from another planet. But our obsession with what’s out there belies, surely, our considerable dislike of what we have become. Perhaps hardest to swallow is Hellyer’s notion that the majority of alien species out there are benign, loving, and progressive. To be supposedly within reach of better attitudes and better technologies — and only not receiving them because we don’t ask for them — seems to be the ultimate in tragedy. So, dear aliens, could you just prove your benevolent ways by sorting out the three things that are bothering me right now. You know what they are, because you have the technology, right? I am asking you nicely. Pretty please?